in a lesser form for Windows-based tablets as opposed to Android-based tablets). The upside of the used PC architecture was that it sported all the standard interfaces also found on desktop PCs. The machine ran on NiMH batteries. They were advertised to last for 3.5 hours. The pen ran on SR48 batteries and lasted for 350 hours. 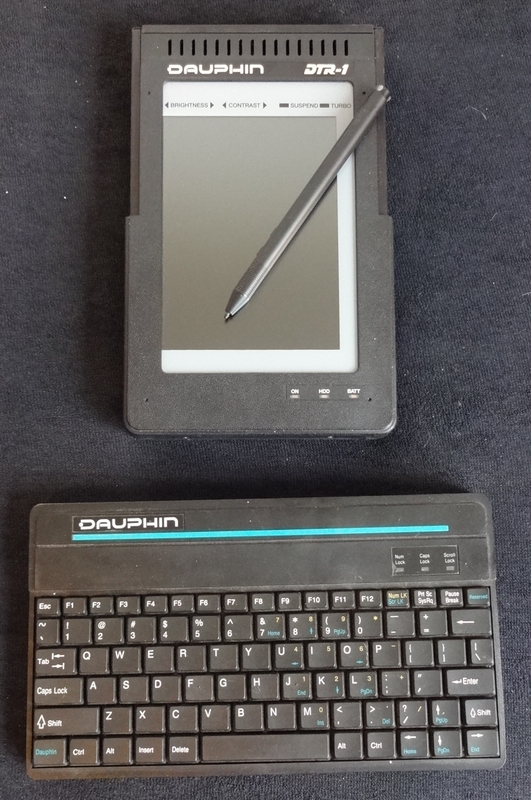 The Dauphin DTR-1 could recognize handwriting and convert it to text on the fly. The DTR-1 was manufactured by IBM. The operating system was “Windows 3.1 for Pen Computing”. Another very interesting feature about this computer is that it uses a tiny HP Kittyhawk 1.3″ harddisk. It seems to be the only computer where this drive came as a standard (it was an option in AT&T’s EO 440 Personal Communicator). Of course, the DTR-1 was not a success (else this blog would not write about it 🙂 ). A quite steep price tag of over $2500 dollars where the initial Apple Newton costed only $700 a year earlier, a high weight, and an OS that was very exotic in the mobile market made the company starting to collapse in 1995. From the reported assets and debts, divided by the price for a DTR-1 I assume that Dauphin made at least 18000 units. Dauphin, however seemed to survived somehow at least until the year 2000. The power supply of the DTR-1 is notoriously bad. People who own DTR-1’s recommend to use modern 12V DC power supplies instead of the original one. The original one is specified at 2.1A. The plug is center-positive. As a pen replacement old Fujitsu pens can be used. In 1996 Dauphin also released a second model (called DTR-2) which was selling for $4445, but very few of them (in the few hundreds) seem to exist. The DTR-2 had a 486SLC2@50 MHz CPU, a 120 MB HDD, and 2 PCMCIA2 slots. There are articles from 1999 about a “Dauphin Orasis” computer based on a Pentium@266 MHz, and there are people that report that they once had such a device, but these machines seem to be even more rare. A shop that still sells original DTR-1 accessories.